In 1973, the American Psychiatric Association removed the gay male and gay female sexual orientation from its diagnostic manual of mental illnesses. Up until that time, the research showed that gay males and lesbians were not any more likely to suffer from a mental illness than their heterosexual counterparts. Researchers even discovered that gay males and lesbians attained more education than heterosexuals. In more recent research, scientists have discovered that people living a homosexual lifestyle are not necessarily as well-adjusted as they could be. For example, research has shown that gay males and lesbians are more likely to commit suicide and experience feelings of anxiety and depression. On top of that, gay males appear to be particularly troubled. They are more likely to be diagnosed with anorexia nervosa or bulimia nervosa than heterosexual males. There was opposition to removing homosexuality from the diagnostic manual in 1973. When research suggested that gay males and lesbians are having a hard time adjusting in society, those who agreed with the vote were concerned that psychiatrists who disagreed would feel vindicated. Psychologist J. Michael Bailey of Northwestern University explained things differently. Bailey suggested that homosexuality was not the cause of the mental illness gay males and lesbians were experiencing. He stated that the reason for their distress was related directly to society’s reaction to their homosexuality. A lot of the time, society’s reaction to homosexuality is negative. Bailey also suggested that problems arise because homosexuality is less common than heterosexuality. It is one other thing that makes people feel different from those around them and is no different from any other characteristic. For example, homosexuality may cause the same types of feelings that someone who is overweight may experience while growing up. Bailey also explains the reason that gay males are more likely to suffer from an eating disorder is because the gay community values those who are thin over those who are muscular. Researchers noticed that differences in the mental health of gay males and lesbians are based on their lifestyles and not on their sexual orientation. They discovered that monogamous gay males who are living with their partners are equally as adjusted as heterosexual couples who are married. Gay males who are older and living alone were not as well-adjusted. The same can be said for heterosexual males and females who live alone. Generally, there is much more understanding for the homosexual lifestyle in the present day than there has been in the past, but not everyone is in agreement. Psychiatrists do not seek to “cure” their homosexual patients today, but conversion therapy does still exist. In one example, Masters and Johnson sought to convert their homosexual subjects into heterosexuals in 1979. In their experiment, they paired gay males with women who engaged the men in a particular sexual activity, such as genital stimulation and massage. They admitted failure 20 percent of the time with the males. When they tried this experiment with lesbians, the failure rate was 23 percent. Currently, there is no evidence that a person can alter his or her sexual orientation. Gay males and lesbians are living at a time when it is more acceptable to be gay, but not everyone’s mind has been changed. For this reason, it can still be difficult for people to “come out of the closet” to themselves and to others. This is especially the case when the gay male or lesbian’s family belongs to a church that disavows homosexuality. The times when people start addressing their homosexuality are often the times that they contemplate suicide. They may have been in denial for a long time before they come to this point. Sometimes, people are largely unaware of their homosexuality until they are suddenly confronted with it and cannot escape the realization that they are gay. Admitting that someone is a homosexual is a very private matter. After they accept it, they can move on to telling family and friends about it. Some people tell everyone they come in contact with that they are gay. Others will tell their family members and close friends. Some people will only tell one or two others. Sometimes, people do not tell anyone at all because they perceive the climate as unwelcoming to gay people. It is different in every town, but in some places, coming out as gay may cause you to lose your job, your friendships and your standing in the community. Things have been changing over the years, and it is possible that the negative consequences that people suffered in the past will not happen if someone comes out as gay or lesbian today. On top of that, these people will enjoy higher levels of life satisfaction than they do currently keeping their orientation a secret. Overall, it is a much more understanding and nurturing climate in America than it has been in past years. What Can You do to Better Your Health? With all that being said, what then can a member of the LGBT community do to ensure they do not fall into societal traps of making them miserable and depressed? Two very timeless and critical topics come to mind. The best way to keep your body healthy is simply by exercising. Often it is easier said than done, but when you weight the benefits of actually getting off the couch/chair and doing it, it’s a no-brainer. Exercise is a perfect way to combat things that ail not only your body, but your mind as we. It has been proven that exercise is a great tool to combat depression, anxiety, stress, ADHD, and post-traumatic stress disorder. As a bonus, you are rewarded with a sharper memory and thinking capabilities, higher self esteem, better sleep, more energy, and an overall stronger resilience. Exercise will only get you so far however, and if you’re eating way more than you’re burning, well the math is simple in such a scenario. Eating right is just as important as exercising, one can argue that it may be even more important in general. We all lead busy lives, and as such may skip a meal or two here and there. This is one of the worst thing we can do to our bodies. To combat being on the go, you can pack healthy snacks such as protein bars, or have pre-made supplement shakes ready to fuel you until you have time to sit and eat properly. Supplements are a great way to supplement your diet, but they should NOT be used as a replacement for eating altogether. You should also consult with your doctor before taking any supplements, especially if you have a known condition, because who knows what they may trigger in your system. That being said, there are all sorts of nutrients out there nowadays in the form of supplements, perhaps too many. The best approach to take is to establish your health and fitness goals first, then seek out the top rated supplements for specific goals. Otherwise you risk spending too much time performing trial and error. 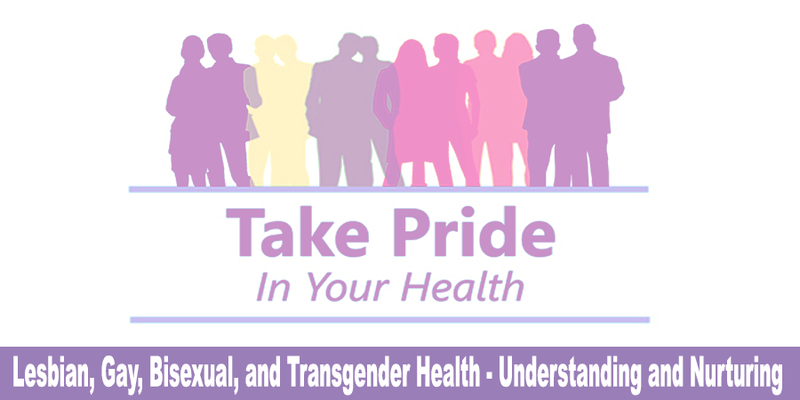 Hopefully this post has not failed to remind you of the importance of your health as a member of the LGBT community. You don’t just owe it to yourself, but you owe it the people around you, the ones who care and love you dearly. Human Sexuality in a World of Diversity by Spencer A. Rathus, Jeffrey S. Nevid and Lois Fichner-Rathus.